Jewelry By Chaddock: Homemade earring "cards"
After I created the cowboy hat necklace displays, I needed to create something to display the earrings. I found the same cowboy hats that I used in the display, in a smaller 2 inch size. Using a corncob skewer, I poked two holes in the rim. Done! I love them and they are perfect for my "handmade in Texas" jewelry! 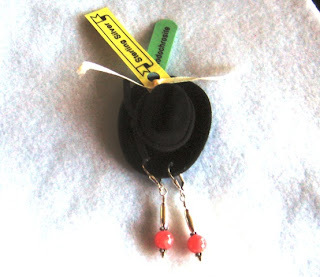 Love the innovative mini hats for the earrings. Great idea.